This is an old story from my days of wanderlust, but too good, and too true, not to tell again. The place is the Yucatan where I’d gone for a winter break and hooked up with a friend. We decided to explore the Mexico not found in guide books, in this case, Progresso on the Gulf Shore. We rode a bus from Merida and jumped out at a pier jutting into the sea. The only thing ahead was the Gulf. We walked along the beach, thinking we’d come to some sign of town; we splashed along the surf, tendrils of seaweed sticking to our legs. We threw rocks and turned over seashells, examining the whorls like curious children. Bill walked on but I dawdled, poking at things with my bare toes. A bottle…a long, green champagne bottle complete with cork lay half-buried in the sand. Odd, I thought, and stopped to pick it up. Even odder was the piece of paper curled inside in a tight cylinder. That caused a flurry of activity on a quiet afternoon. We pried out the cork. It was, indeed, a note, written in a hastily scrawled, block-lettered Spanish on notebook paper. We deciphered it as follows: The boat Santana has broken her propeller and is about to sink. Please inform the captain of the port or equal authority. Longitude and latitude were printed at the bottom. A boat sinking! A note desperately thrown to the sea! To the captain of the port! We had a mission. However, since we still hadn’t found town we had even less of an idea how to find a captain. We’d walked a long way and figured we’d need to go back to the pier. A road bordered the beach some fifty feet beyond the dunes. We briskly began our march. An open cantina appeared. Rescuing boats is thirsty work and we were thirsty. Over cold beers we showed the note to the lone boy who served us. “¿Donde esta el capitan del puerto?” we asked. He didn’t know. “Allá,” he said, waving his hand in the direction we were walking. Everywhere is allà in Mexico: in other words, somewhere else. We walked on toward allá. We showed our note to everyone we met along the road and practiced our “¿Donde esta el capitan?” No one knew, nor were they particularly interested. Perhaps notes in bottles are a common occurrence living close to the sea. Reaching the pier, we found an official looking office. We thought a telephone call would be a simple affair. Telephones in Mexico are never a simple affair. We showed the note. Could we call the captain? No, there was no telephone in this office. The note went from hand to hand. Was there a telephone anywhere? Pues, there was a telephone upstairs. Could we use the telephone upstairs? Wait. We waited. Two people arrived from the office upstairs. They read the note; they told us to wait; they went away. By this time nearly an hour had passed. If the boat were in perilous waters, we hoped it had oars. A Navy Police van arrived and an officer in starched whites marched into the office and invited us to come with him to the captain of the port. We glanced at each other as we climbed into the van. Was this smart? Did we know what we were doing? The van stopped outside a large, white-washed building. Guards along the sidewalk snapped to attention. The officer ushered us through heavy wooden doors to an imposing room, rich with polished brass and leather. Framed sea maps lined the paneled walls. I’m not sure what we had expected, but certainly something less elegant. A small, dapper man dressed in sparkling whites sat behind a large desk. An aide stood beside him, collecting papers as the captain signed them. We checked our legs for clinging seaweed. Between us, I had the best command of Spanish, so as Bill edged off to examine maps, I stood in front of the desk, feeling like a child called to the principal’s office. The captain finished signing the papers and dismissed his aide. He greeted me and introduced himself in long Spanish phrases thick with vowels and rolling r’s. I couldn’t make out anything, but I nodded. He asked to see the note – I understood that – and I handed it over. He copied the note onto the pad in front of him, precisely and carefully, checking the facts over and over as if this were the most important item of his day. Finally he looked up and asked a question. My Spanish failed me. I had no idea what he’d said and smiling and nodding wouldn’t work. I asked him to please repeat the question and to please speak slowly. He slowly repeated his question in precise, British-accented English. “Oh, well, about two hours ago,” I stammered. I explained where we’d been walking. I had no idea; but I agreed. “And did you see anyone else around? Were there any boats nearby?” He looked up at me suspiciously. Bill ambled over from the wall-long map of the Gulf. The captain brightened visibly at the mention of his map as well as the possibility of dealing with a man. My suspicious presence was forgotten. He got up from his desk, went to stand in front of the expanse of paper Gulf, and pointed out the latitude and longitude written on the note. Bill’s finger followed the coastline around to Campeche and darted inland. He was more interested in the ridges and lines that made up the landmass than the wide blue expanse of featureless sea. The captain’s finger followed his and pointed out the town. Our desperate mission had turned into a shopping lesson. When we left, we were polite, saying the gracious compliments our limited Spanish allowed. No van waited to transport us. The guards didn’t salute. We were on our own. Two months later, back at home, I received a letter from the Captain. Carefully phrased in elaborate Spanish, he said a search had been made but no boat named Santana with a broken propeller had been found. Perhaps another ship had found the boat and brought it into shore, he wrote. Perhaps drunks had written the note as a joke, he added. Or perhaps the Santana sunk. Well. Perhaps it had. 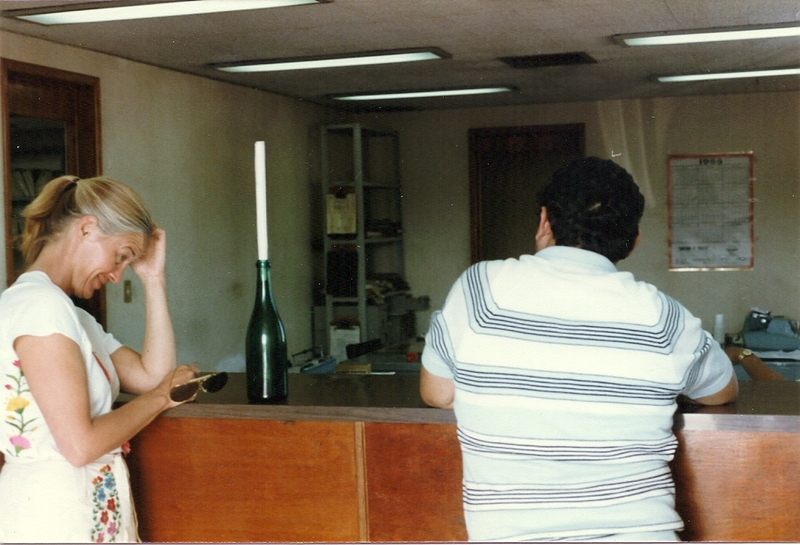 But I still had the green champagne bottle, complete with cork, and the faded message for some captain in some port. If you have an SOS!! story, go to http://dailypost.wordpress.com/2014/01/31/daily-prompt-water/. Previous Daily Post: But No Cigar! A wonderful story, full of mystery and humor. I will worry now about what happened to the Santana. Well, that’s one of life’s mysteries. Never did find out. But then, I’ve not been back to Progresso either! Thank you, Judith! You’re very kind. The piece was published some years back in the Chicago Tribune. Today’s is a re-do although I did some more editing today before posting…but I guess we never stop fiddling with pieces. Thanks so much for being a loyal reader.